Whether it’s a class presentation, at a conference or a teacher presenting a lesson, you’ve probably seen this PowerPoint fail. The presenter is all excited about showing you their new, cool explanation of subtraction with re-grouping or how to improve aquaculture. It doesn’t matter the topic because you never see it. All you see is an X or black box where the animation is supposed to be, there is just a picture of a speaker instead of sound. We include PowerPoint presentations and pdfs on our website for teachers or homeschoolers who want to have a pre-packaged- have the student play a level, show a video clip, go through a Powerpoint and emphasize key points. We have not used animation at all in the Powerpoints because we have seen it fail so often, but now I’m wondering if there is a work around. Say, have animation in the presentations and the pdf without animation as a fallback. Please don’t suggest Google slides because many schools, after-school programs and families in rural communities who use our games have very limited internet. What’s your experience on using PowerPoint sound and animation? Getting better? Don’t do it! Let me know what you think, please. 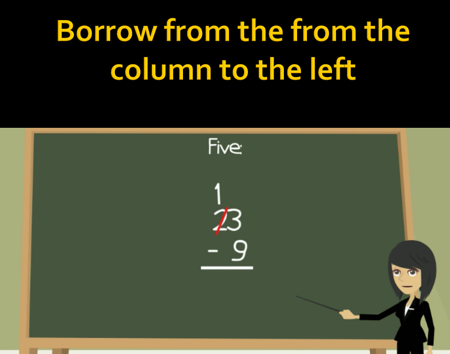 BTW, if you are interested in teaching subtraction of three-digit numbers, that is covered in Spirit Lake: The Game, the game that uses the video and powerpoint shown above. Most of Spirit Lake is multiplication and division. ← What Do a Caribbean Island and a North Dakota American Indian reservation have in common?